Was June horrible? : Yes! 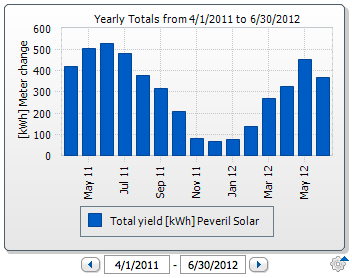 At the end of the month, the PV statistic displays what a horrible solar month June 2012 has been. You can see from this that June 2012 was worse than April and August of 2011. May was only acceptable because there was the one-week heat wave in May with 7 days of unbroken sunshine... oh how quickly we grew to take it for granted! 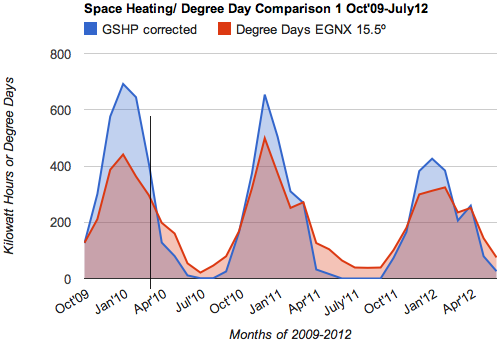 Despite the cold conditions, the GSHP consumption is not offensively high because the insulation of the house is sufficient for us to get most of the last two months without needing the heat. 24 June 2012: The bad weather continued with people in Yorkshire being flooded out (my sister in law lives in the worst hit, Hebden Bridge, although she is safe on the hillside above. England did well in Ukraine beating Sweden and Ukraine, but finally went out to Italy on penalties (after looking not good enough to beat Italy). 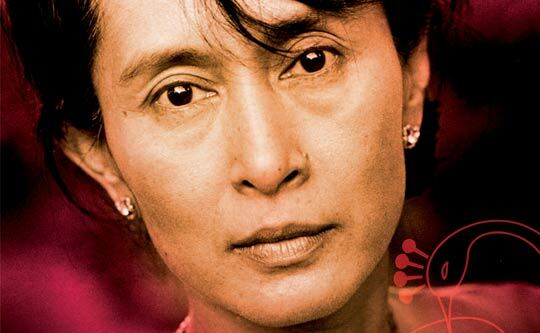 The Dalai Lama and Aung San Suu Kyi visited England, and ASSC spoke to the UK parliament, apparently the first female foreigner to do so. She seems to be regarded as the Nelson Mandela of our decade. She is also receiving the Nobel Prize whilst in Europe. Jimmy Carr had an embarrassing time as his tax dodging was revealed by the prime minister, the PM not revealing that the source of his family wealth and that of some of his party's funders was from the same activity. In Rio, the climate summit that is meant to make the planet safe for future generations passed almost unreported - we'll find out if some decisions were made. Egypt's islamic presidential candidate won, so expect some consequences there! For the Peveril Solar house, what? GSHP annual holding out at 2,975 kWh. Solar PV looking worse at 3,148 kWh but as I only expected 2,800 when they were installed, I have to be grateful that it is above 3,000 even in this bad June. Surya system is showing 2,585 kWh (and won't get back to its previous glories of nearly 3k until next April). Ground Temperature is 12.9ºC..... holding good considering the lack of sunshine. 17 June 2012: Well in other parts of the world, there are Greek elections (knife edge for destiny), Egyptian elections (another knife edge for destiny? ), Football elections (who plays best wins), the slow burning farce of the US election (US billionaire offering unlimited money to buy the election for the mormon asset-stripper / failed governor). Oh, and the Queen visited Nottingham this week (with William and Kate), but somehow failed to make it to West Bridgford to check out solar panels. House annual 4,995 kWh (dangerously close to 5,000 ) but biennially its 5,148 kWh/yr, so let's hope it doesn't go above that as this cold and rainy non-summer continues. GSHP annual 2,972 kWh (dangerously close to 3,000 ) but biennially its 3,154 kWh/yr, so ditto about the summer. PV, this is a horrible month. 3,204 kWh annual, depressingly dropped from our glorious heights of 3,450 a few months ago! We are in the 17th June now, and scored only 183 kWh in the month, and last year, we scored 317 kWh in the same time period, and 525 kWh in all of June 2011. Sunbox+Tubes annual, I won't know for a while, but as I had a new meter fitted and lost a whole month of April action, the annual amount is 2,596 kWh. Gradually this will climb, I hope, and will leap ahead next April when the missing month gets peeled off the calculation. The new question is to compare the performance of the Sunbox versus the Tubes. On this, Time starts on May 10th when the heat exchanger was finally in place. From 10 May to 17 June, the Tubes have captured 101 kWh and the Sunbox collected 350 kWh. I'll report on this in a separate posting.